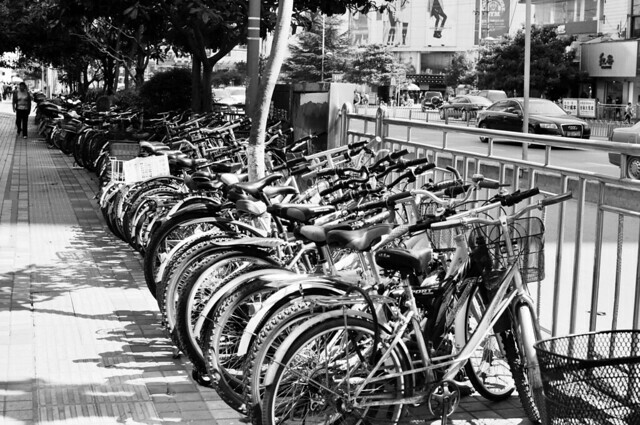 When I ride my bicycle in Kunming, I rarely worry about flat tires or leaving my bicycle unattended. The city’s major roads are dotted with small repair stands and designated parking lots especially for bikes. The people working at these roadside service stations encounter the city’s changing traffic conditions first-hand. I wanted to hear from them. I partnered with Kunming-native and Yunnan Normal University student, Crystal Hao, on a walk down People’s Road (Renmin Lu). Crystal and I met a young bike parking lot attendant. Originally from outside of Kunming, he has been working at his friend’s bike parking lot for a few months and attends to it alone most days. He was very enthusiastic about speaking with us and shared his hope for the city’s new subway system. A day of parking costs 1 RMB (16 cents USD) for a scooter and 0.5 RMB (8 cents USD) for a bicycle. During these video conversations, it has been invaluable to collaborate with Crystal, who can communicate and understand the Kunming dialect. The Kunming dialect is distinct from Putonghua (Mandarin Chinese). Although Mandarin Chinese is the nation’s official language and taught in schools, each region has their own variation of spoken Mandarin Chinese, as well as their own languages. Post by Sewon Christina Chung.